Participants will build two triangles, two rectangles, and two squares and link them together. Set up the table or other work space and surroundwith chairs. 1.Seat the participants around the table or workspace. Orient the participants to each other and open with a brief discussion on facing difficult challenges. Your group is on a cruise in the Panama Canal, and the ship engine has just blown a “whatzit.” It happens to look like a triangle, a rectangle and a square, made from Toobeez. The whole cruise ship is depending on you! Help build two of each of these parts and link them together in order to repair the engine so everyone can continue the trip. It is up to you to save the cruise! Activity Challenge: Participants will build two triangles, two rectangles, and two squares and link them together. 4. Provide easy access to the Toobeez for the group. 5. The participants should now problem solve to build a triangle, a square and a rectangle from the Toobeez available to them. Therapist Note: You may want to only provide the pieces they will need. 6. Encourage the group with verbal prompts (if necessary) to get the group started. 7. 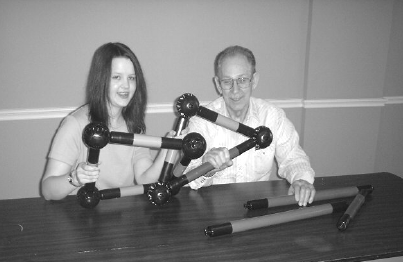 As participants assemble these shapes, instruct them to link the shapes together like a chain. 8. Hand-over-hand intervention may be necessary from the therapist or activity professional, depending on the ability level of the group. 9. Praise the group often, and assist the participants when needed. 1. Allow no verbal or written communication. To make it a bit more challenging, do not allow team members to talk or use any written communication during the activity. 3. Build only one set. Depending on the ability level of the group or individual, a “Whatzit” can be built by squares only. How did you feel when you heard about the task? Was it hard to ask for help if you needed it? Did someone say something to help you today? How does this activity relate to your life?